Today, I used an app to get a man in a tent to hand me toilet paper. Curbside is a new shopping app for iOS and Android that lets you choose and pick up items from local stores including Target, Crate and Barrel, Home Depot, Toys R Us and others. Once you’ve purchased your items Curbside says they will typically be available within an hour for pickup via tents that sit outside the stores. You don’t even have to get out of the car, just pull up, give them your name and away you go with your stuff. They don’t even charge a premium for the service. So I gave it a try. While my job requires me to be online all day, I also meet with companies on a regular basis. Actually nearly every day. And while all these trips seem like optimal opportunities for quick shopping trips, I don’t want to be the guy that’s buying socks when Apple introduces the new Apple Drone. So Curbside seems like a good way to grab a few items on my way home from meetings without wandering around a store and standing in line. 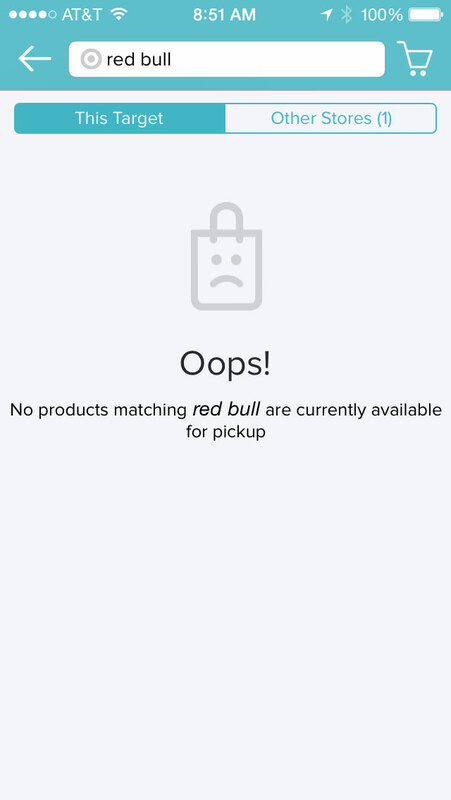 I launched the app, picked the local Target and searched for Red Bull. Uh ok, so I searched for deodorant and was presented with brands I don’t wear. I searched for face wash and again, stuff I don’t use. The app and service suffer from the same issues I’ve had with Google Shopping Express: the limited stock that the stores offer with the service. The stores give Curbside an inventory of what’s available. So it looks like Target doesn’t want me amped on Red Bull or keep me from smelling like I just returned from a five day hike. What it did offer and what I needed was toilet paper. I added the TP to my cart and after a relatively painless sign in process that included adding my credit card, I made my purchase and the app told me it would be ready in about a hour. Less than 30 minutes later I got a text message that my order was ready for pickup. So that my carefully selected toilet paper didn’t sit out in the elements any longer than it had to, the Curbside app uses your location to alert the associates at the tent that you’re on your way and prepares your order for delivery. 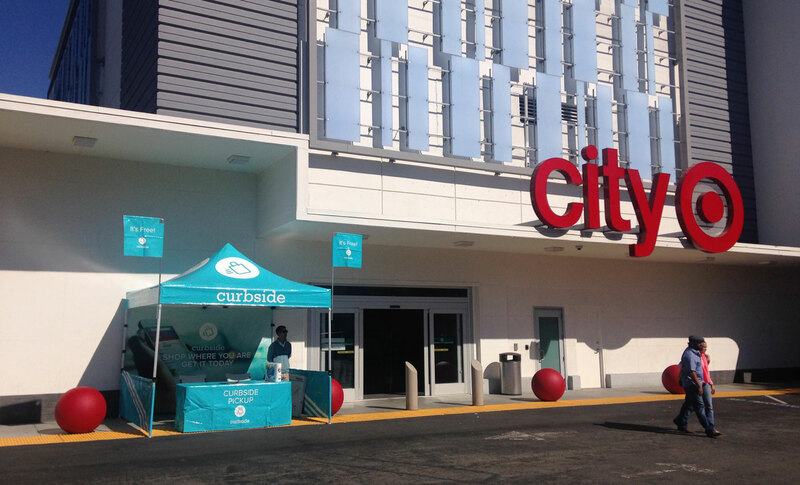 Curbside uses a a geo-fence so your actual location is never shared with an associate, just that you’re near the store. I arrived and a single gentleman under a branded tent stood outside Target with my toilet paper. I walked up, gave him my name and he handed me my order. Usually you would be expected to show them the app with your receipt. If I had had driven, I could stay within the confines of my car and he would have put my order in the trunk for me. Alas, I ride a Vespa and my pile of bungie cords used to strap items down is a Gordian Knot that only I can untangle. You can see my toilet paper on the table if you squint really hard. Today was the first day this particular Target got Curbside support and my order was the only item in the tent besides the associate, a six-foot table and two folding chairs. I’m sure if I had ordered multiple items and it was the holiday shopping season, I might have had to wait longer than 30 minutes for my order to be fulfilled. Also, the app says I should pick up my orders within 48 hours which means if I’m delayed for whatever reason, I can pick up my order the next day. The tents and ordering are available during the same business hours as the stores. While it seems like an app like this shouldn’t thrive in a world with Google Express and Amazon deliveries, I see myself using it in the future. Google Shopping Express is nice, but it relies on me staying at home during a delivery window like I’m getting cable TV installed. Sometimes I just need a few items and if someone else can do all the actual shopping and I can just pick it up, that’s pretty great and I think others will agree. As long as you don’t want Red Bull or a very specific type of deodorant. Curbside is currently only available in Silicon Valley and San Francisco.